As the summer winds down my thoughts are turning to my 2016 Travels that start in January. It's time to start to make design changes to my storage space and solve some problems. I drive a Tavoma truck & the Prius. The truck is four-wheel drive and has a lot of ground clearance. The Prius has a very low ground clearance and my 2015 Travels with the Prius this year resulted with a number of run-ins with curbs scraping the bottom of the bumper. When I bought the Prius used it already had a number of similar marks on the bumper from the previous owner. On top of this I do of off road travels in BLM & Forrest Service Land to boondock and they have many less than improved dirt roads. Keeping the Prius from scraping is a challenge when driving in these conditions, although time has helped with my skills to gage them and navigate better. On my trip home in Kansas in a park campground I woke to very dense fog and I turned out of my camping spot too soon and dented the bumper. I had the bumper replaced this July (see previous post) and now the question is how do I keep my bumper from getting beat up again. 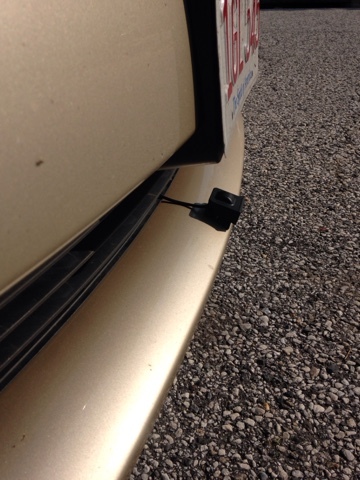 I was going to add a forward facing (front bumper) camera to my existing backup camera system, but then I ran across this bumper (proximity) sensor that I decided to add to my list of mods to my Prius. 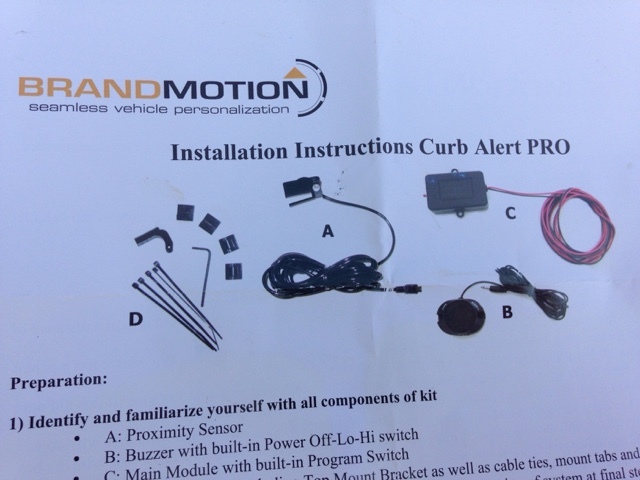 My choice was the BrandMotion's system. There are 3 main parts. I installed the bumper sensor first needing to get the wire around the grill area and through the Prius firewall. I chose the rubber boot going through the firewall that the main wiring harnes goes through. I used an awl to punch a hole in the rubber boot and filled the hole with a coat hanger through it to use as a wire pull. I first pushed the coat hanger through from the engine compartment and attached the pull wire to it and pulled through the firewall. I then used this wire to pull the cable from the sensor back in the engine compartment into the passenger area. The Prius is tight on room to work such things, so I got a few cuts and scrapes with some minor bleeding on the back of the hand. In the front of the car I removed the plastic panels under the dash and it was not difficult to catch the wires inside the car. I did not stick the sensor to the bumper yet. Next I installed the control module. 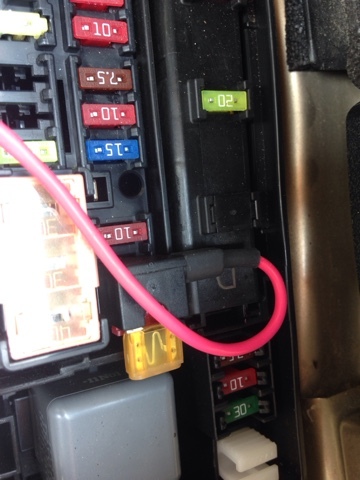 I then remembered the fuse box is in the engine compartment so I needed to run the red/black power wires through the hole I put on the rubber boot in the firewall. This took some more work but did get the power wires through the firewall too. I did not mount the control module yet as it needs to be setup/programmed. I rain the power wires along the route other wires are run to the fuse box. I put the power wires with the front sensor wire in a plastic loom. The power wires split before the fuse box and I mounted the ground wire to the Prius ground location next to the fuse box. I ran the power wire up into the fuse box along other wires. I connected the red wire to a micro fuse jumper I got at the auto parts store. This device allows me to remove the fuse in the fuse box and install it in the jumper, supplying power to the original circuit. Next I added a 5 amp fuse in the second fuse position on the jumper that feeds the red wire that I connected to the control module. Then the problem. I chose the radio circuit only to find out that the radio fuse is always hot although the radio isn't, so there must be a control relay somewhere. 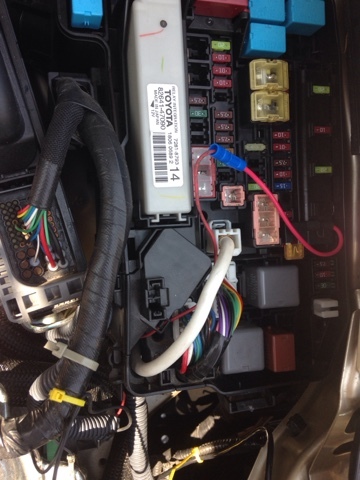 I got my volt meter out and found only a couple fuses are tied to the ignition on. I chose the circuit with the label ignition and finished the wiring by tie wrapping the run. The next step is to connect the sensor by just plugging it in as it has a micro USB connector. Then I plugged in the speaker. 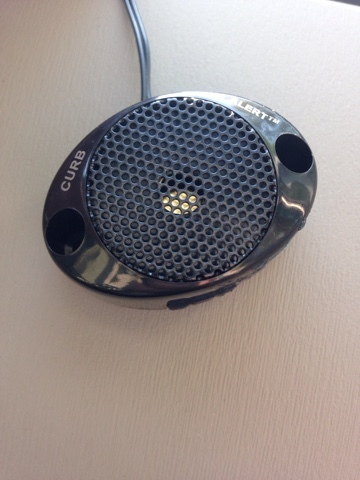 Turning on the power gives a few test chirps. I found a cardboard box with the same height as the Prius front travel height. Then I fixed the sensor mounting it on the Prius front bumper lower grill opening. I pointed it down on an angle and put the cardboard box 12 inches in from of the sensor. The unit started beeping And to set the distance I pushed the red button on the control module to lock it in. I didn't permanently install the control module and speaker as I am running the unit at these settings to see if more adjustments are needed. 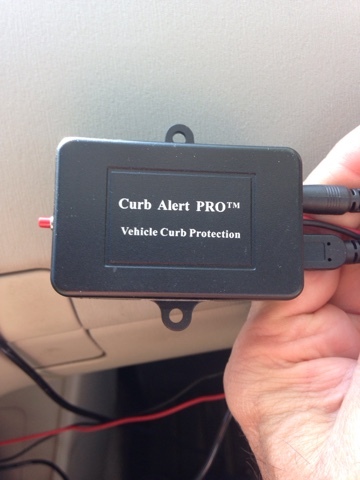 I have had the opportunity to test it approaching curbs and since the sensor is very directional and it works. As soon as I approach a curb slowly it sounds & I stop & the 12 inches gives me some grace to not hit the curb. I haven't previously thought about diagonal curb parking without a curb stop on the angle and the 12 inches worked well as it was 12 inches away in the direct center and 1 inch from the passenger side and 18 inches on the drivers side,so I didn't hit. As I started off saying I thought of a camera & this sensor and there are benefits to both, but I chose this for now and it appears to work well. I did get one false notification coming down a steep hill where it meets a level cross road and the sensor picked up the cross road facing down hill. I would guess that the same would happen going up hill if perpendicular.